The trailers listed here are private sales by Rideau Mac Resort Members. All sales are made between you and the member selling the trailer and share. As members of Rideau Mac Resort we welcome all new residents/members and if you have any questions regarding our park policies and restrictions please contact 613-218-1540. 2008 3-season 12 x 42 Breckenridge Cottager with peaked shingled roof, located on a large lot with view of lake. 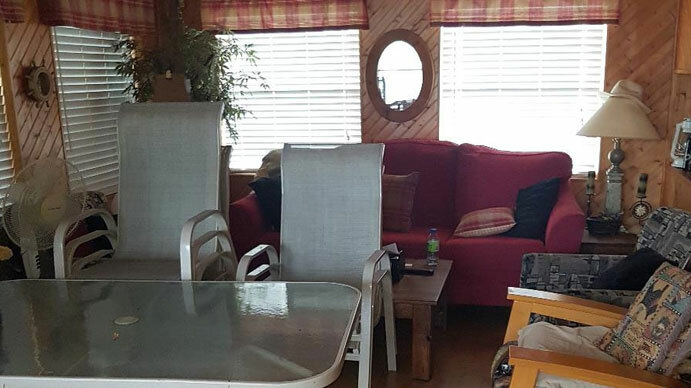 Cottager has a propane furnace and central air, 1 master bedroom and a den with sofabed. 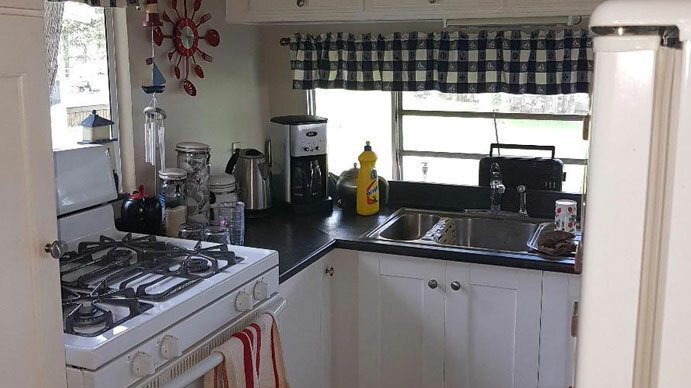 Kitchen has full sized fridge and stove, double sink and plenty of storage. Bathroom has standard flush toilet and 3/4 tub with shower and skylight. 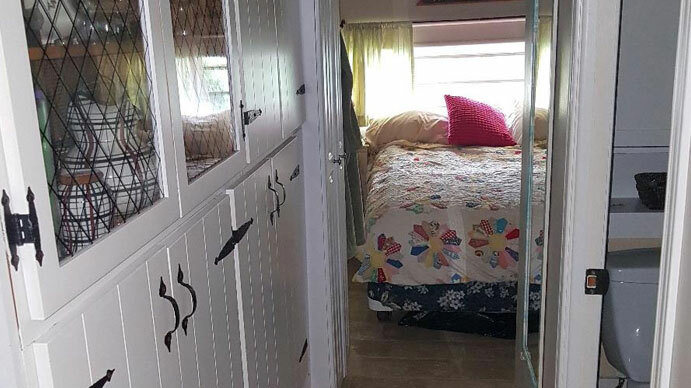 Beautiful finished Add-on room is 8×30 with vaulted ceilings, contains full-sized fridge for drinks, along with sofabed for additional overnight guests. Attached large 10 x 30 deck with awnings. Newer 8 x 12 Amiish style shed with metal roof provides ample storage. Water and beach view . Three Slides with Added Lanai 12 feet by 20 feet approx. 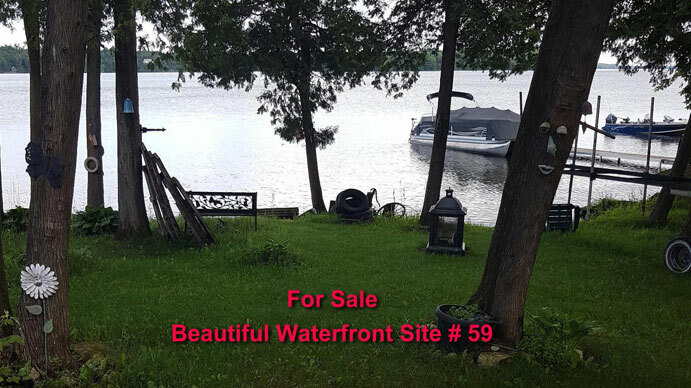 Huge lot on the pristine Big Rideau Lake. Own a piece of paradise without the high up-front and ongoing cost of cottage life. This 38ft. Sport Vision fifth wheel trailer is situated on a large waterfront site of Rideau Mac Resort. It sleeps four (Queen size bed in private master bdrm and a pull-out couch in main salon) and has 3 pushouts. Also has attached add-on with a propane in-wall heater and a side deck to sit and enjoy the view of the lake. 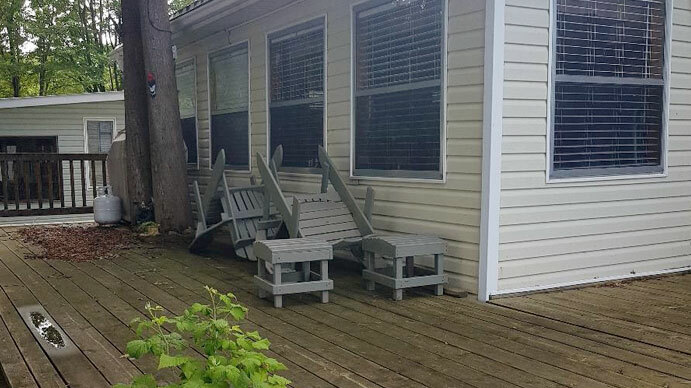 As purchaser you would own a share of the Rideau Mac Resort which is a 75 acre waterfront property on Big Rideau Lake with 2000ft. of shoreline. Amenities include playground, horse-shoe pits, volleyball court, sandy beach, main dock, boat ramp and a rental Lodge which is self supporting. 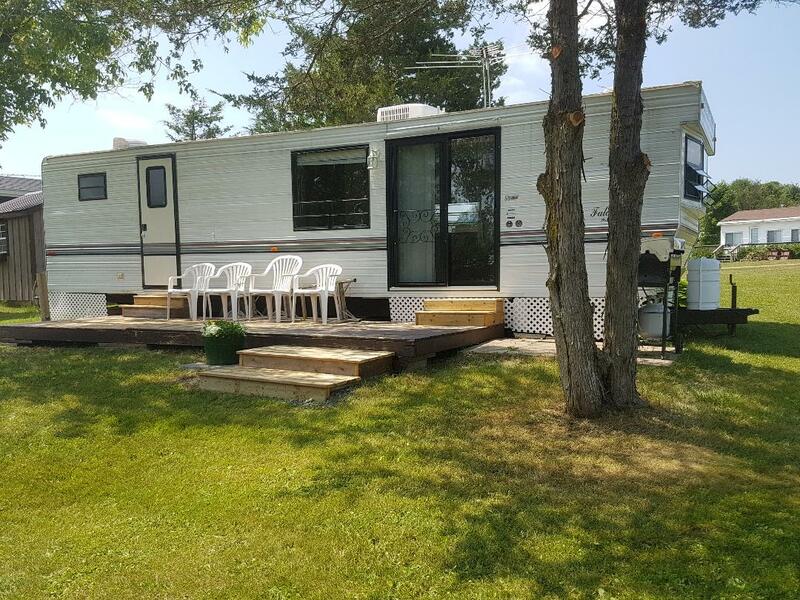 Located at Rideau Mac Campground in quiet area of campground with friendly neighbors. Large site with excellent view of the bay, lake and campground from on top of ridge. Two adjacent electric tipouts transform the inside into a large living/dining area with electric fireplace and built in TV and stereo system with 2 outside speakers. Electric awning over good size deck. Bedroom with queen sized bed adjacent to 3 piece bathroom with shower. Has portable gas grill that mounts on trailer and outside shower. Sleeps up to 8. Trailer comes with most furnishings including dishes, cutlery, table and chairs and couches. Picnic table on deck. Also comes with shed.